A fun story with adorable illustrations to match. There isn't really any sort of moral to the story - it's just a fun read. Horace and Hattie are two adorable little hedgehogs who love to do all sorts of things together. They swing, and search for lucky clovers. They splash in puddles, and throw fancy tea parties. There’s nothing the prickly pair can’t do…except one thing. They can’t give each other hugs. Awww! Horace and Hattie have tried all sorts of ways to get around it, from covering themselves in snowballs to rolling in leaves, but they are just too spiky to make a good friendly hug work – until one day, they stumble across the perfect solution to their problem. 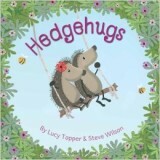 Hedgehugs is a cute little story that will delight young readers with its colorful and adorable illustrations. The hedgehog pair are featured on every page, doing fun things like rolling in logs and watching the stars. While I can’t say there’s any sort of moral to it, it’s a fun story that is just perfect for a snuggly bedtime story. There are just a few sentences for page, so new readers should be able to tackle it with confidence. In the end, the hedgehogs find a creative solution and hugs abound, so it’s a fun story all around. Hedgehugs is a fun story that young kids will enjoy. The two hedgehogs friends featured in the story are cute and cuddly…except for their pesky spikes. The colorful illustrations combined with a simple but cuddly story line is the perfect blend for young readers to get lost in.